Many moons ago, I worked as a outdoor recreation leader and nature interpreter. Yep, that was me circa 1995: packing up the first aid kit, handing out the whistles and trundling off into the wilds with a group of 20 or so ankle-biters in tow. Asking me everything from “What’s that tree?” to “Are we lost?” and “Is it okay if Billy just ate those?”. In an outdoor setting it was easy to get kids and their families excited about the environment, and sharing ideas about why and how it should be protected. These days, I’ve traded my hiking boots for a business suit, trash pickers and gloves, and the unique beauty of nature for the back dock of a convention center. And I wonder why people don’t get excited about sustainable events? Truth is, events do have the power to change the world for good, in ways that help us make quality of life better for us, and the many we share this planet with. But they can start from a disadvantage when inspiring advocacy among attendees is hampered by the cavernous concrete of an exhibit hall, or the generic anywhere-in-the-worldness of a hotel meeting room. One solution, of course, is to take us outside, to those people and locations where we can make a direct connection with the issues we are passionate about. Or perhaps bring the people and issues to us, where feasible, through a service activity, presentation or rally on a topic of interest appropriate to the event and those taking part. Another way is to create onsite interpretive experiences that encourage participants to learn, discuss and mobilize action on an issue. A couple of years ago I looked at a small community event that used their planning powers for good, by providing education, conversation, pledge and action about water and ocean health. Earlier this year I came across another example. This one focused on social justice. The United Methodist Women’s Assembly takes place every four years, bringing together women of the faith for fellowship, celebration, learning and most importantly, action on issues of importance to them. Their event theme “Make it Happen” was vividly demonstrated on in their Experience Hall, which featured interpretative spaces orienting them to advocacy on important social responsibility issues. 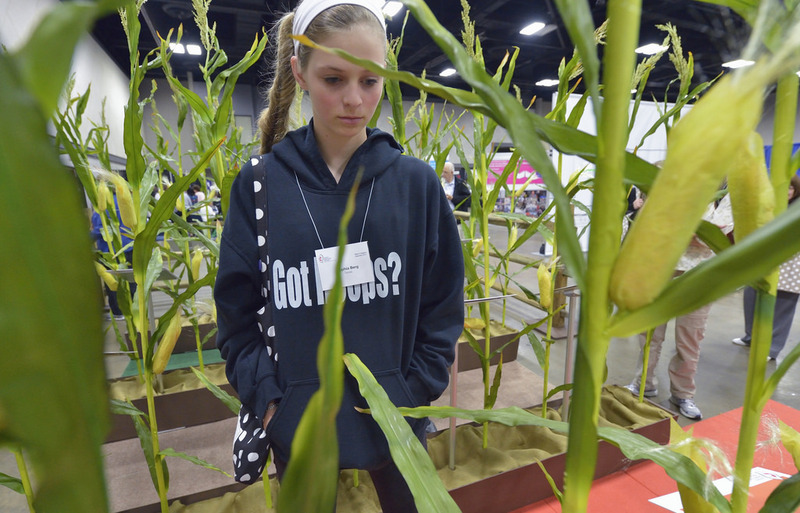 This walk-through exhibit explored social issues related to agriculture, including a Tool Shed of advocacy links and resources. Sophia Berg of Texas makes her way through The Field. Photo by Paul Jeffrey for United Methodist Women. Interpretive plaques include statistics, testimonials and policy initiatives for social responsibility reform in the US agriculture industry. 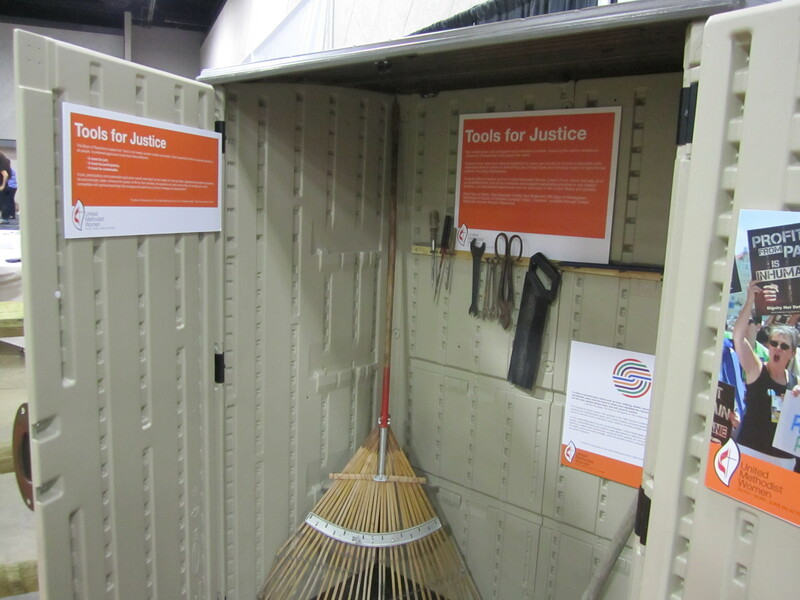 The Field Tool Shed includes activism resources on immigration reform, labor justice, women’s issues and climate change. 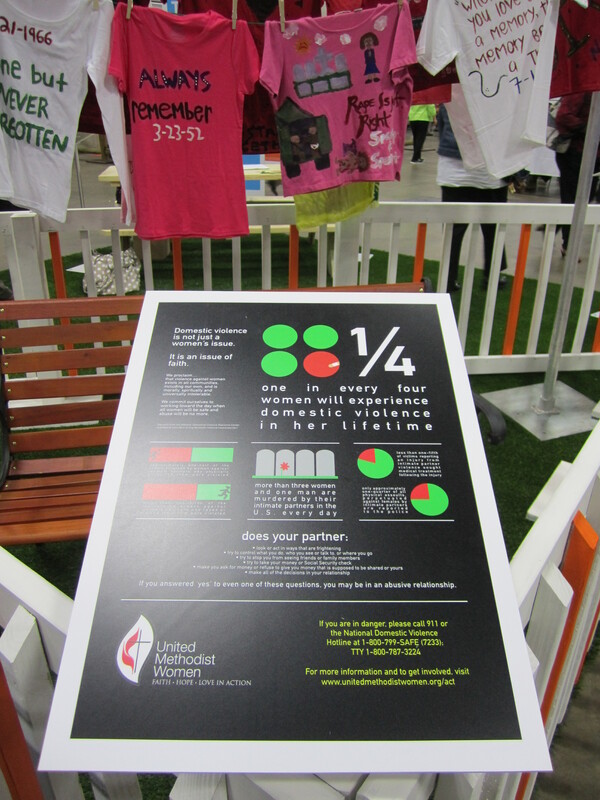 How prevalent is domestic violence? How do you spot it? What do you do when you or someone else is affected? 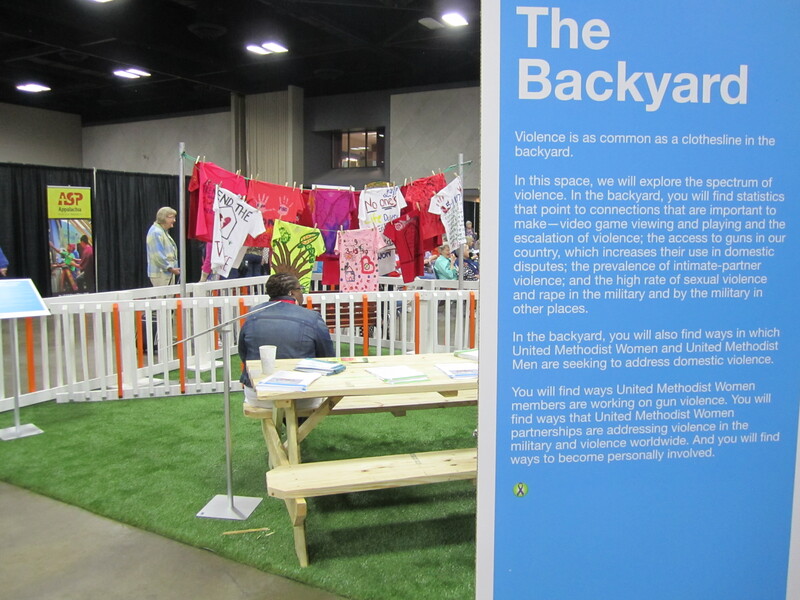 The Backyard exhibit was both sober memorial and action-oriented solution regarding this important issue. Places to sit are provided in all justice exhibits at Assembly. The Backyard space provided picnic tables for quiet solitary reflection and prayer, or conversation for those seeking to connect about the issue. As with the Field, interpretive signage provided statistics, diagnostics and helpful resources for those seeking to act. 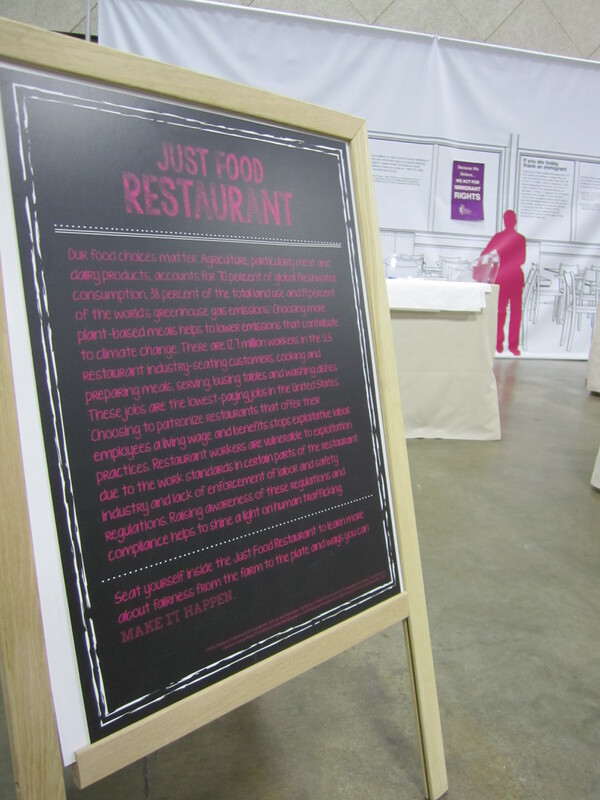 The Just Food Restaurant focused on the plight of those who prepare and serve our meals. 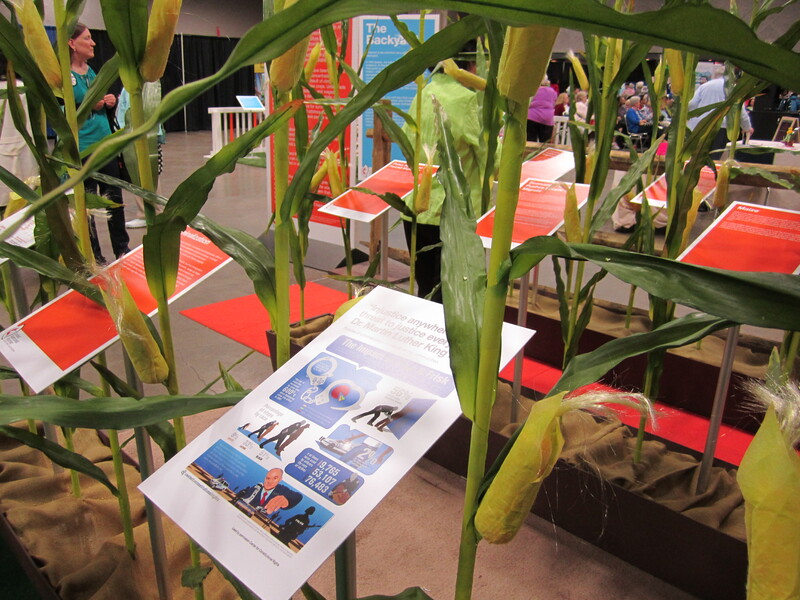 Touching on issues such as living wage, health and safety, participants are invited to seat themselves inside the exhibit and learn about fairness, from farm to plate. 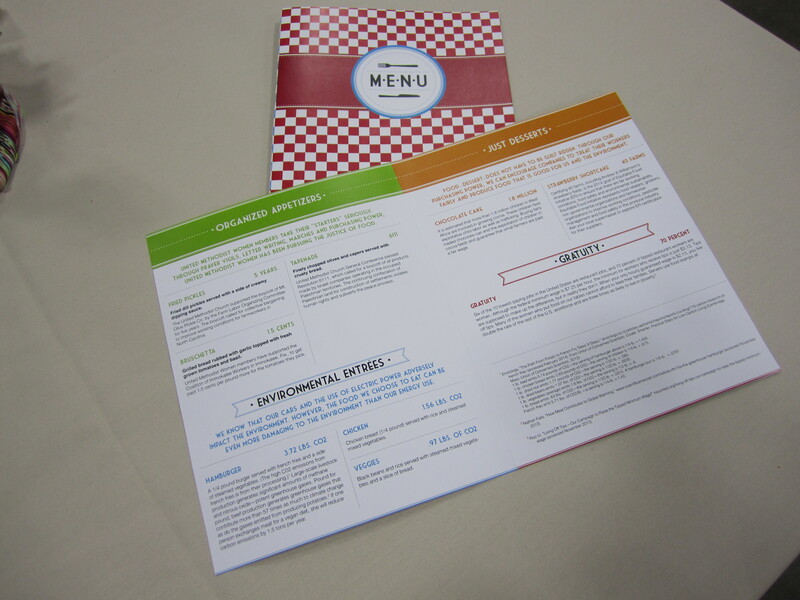 Fairness and climate-friendly meals are on the menu in the Restaurant, with patrons learning about everything from low-carbon diets to the hidden labor cost of different food commodities. 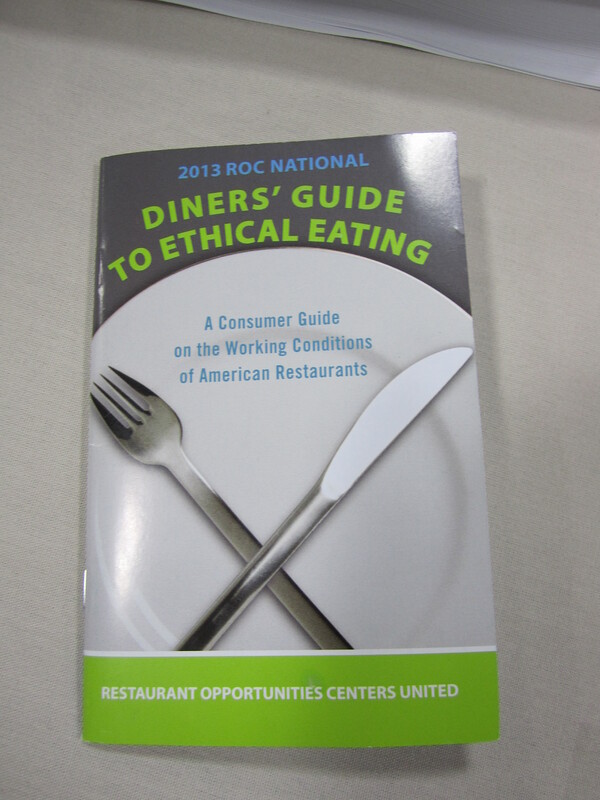 Ethical dining guides were available for download from ROC United. Education about social justice means little if it is not followed by action. The Kitchen is where UMW’s social justice exhibits become most interactive. It is where members can learn how to mobilse and act to address issues in their communities. 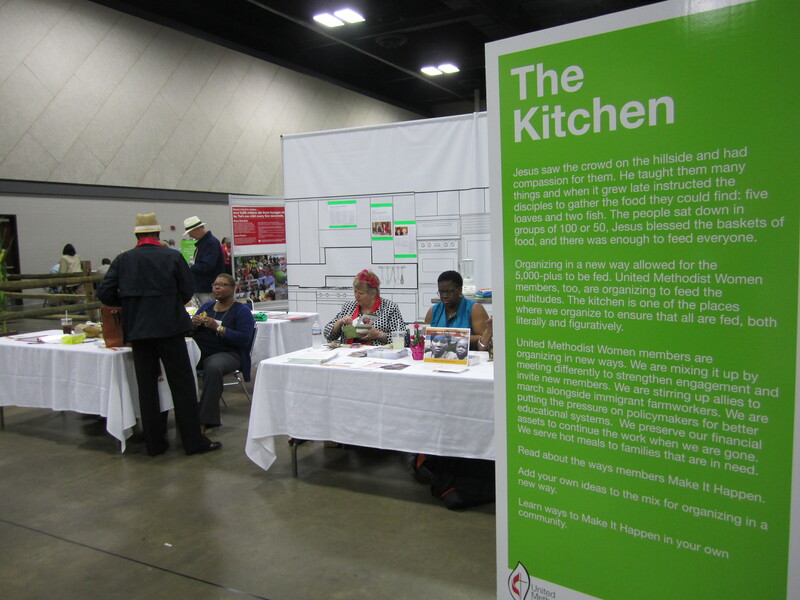 Having learned and absorbed the knowledge from the various social justice exhibits at Assembly 2014, participants could sit down in The Kitchen to learn the recipe for advocacy success. 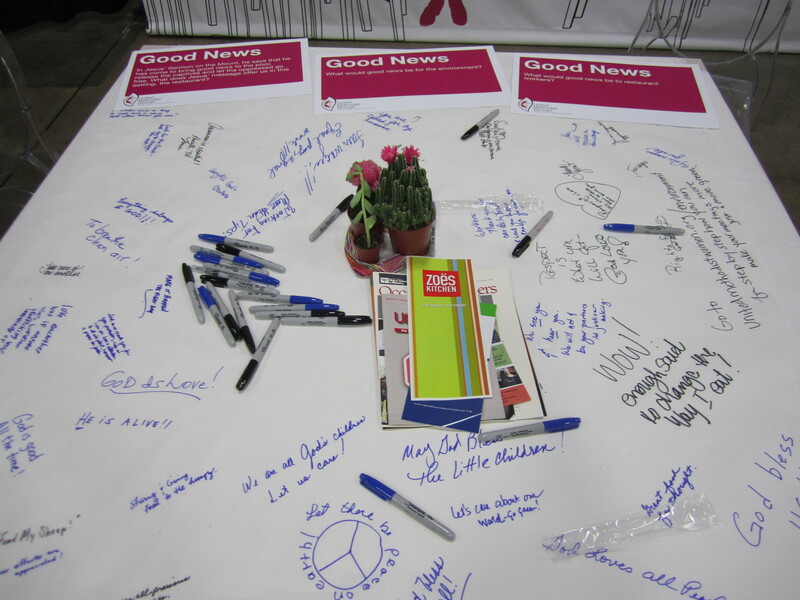 Notes, pledges and commitments from Kitchen conversations are jotted down on table tops by attendees and their mentors. Advocacy can be an important purpose of events, particularly those hosted by organizations in the non-profit and association sector. Providing experiences that emotionally engage, create conversational space, develop skills, equip with tools and catalyze action can seem like a tall order, but is possible, including these few examples from the United Methodist Women. What other effective examples have you seen?